In The A Level Mindset, Steve Oakes and Martin Griffin share the secrets of coaching students to develop the characteristics, habits and mindsets which will help them realise their potential. Those students who make real and sustained progress at A level aren't necessarily the ones with superb GCSEs. Some students leap from average results in Year 11 to outstanding results in Year 13. Others seem … to hit a ceiling. But why?It was in trying to answer this question that the VESPA system emerged. Steve and Martin have cut through the noise surrounding character development and identified five key characteristics that all students need to be successful: vision, effort, systems, practice and attitude. These characteristics beat cognition hands down. Successful students approach their studies with the right behaviours, skills and attitudes: they understand how to learn and revise effectively, they're determined and organised, they give more discretionary effort and they get top results. Success at A level is a result of character, not intelligence.Much has been written about growth mindsets and character development in recent years, but teachers are still left wondering how to apply these ideas in their contexts: how can these theories help learners in practice? Taking cues from the work of Peter Clough, Carol Dweck and Angela Lee Duckworth, and informed by their collective 30 plus years of teaching and coaching, Steve and Martin have spent years researching how character and behaviours affect student outcomes in their sixth form. After identifying the core traits that contributed to student success, they developed practical activities to help every student develop the A Level Mindset. 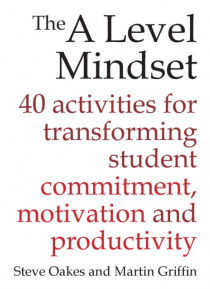 Discover 40 concrete, practical and applicable tools and strategies that will supercharge learners' ambition, organisation, productivity, persistence and determination.Suitable for teachers, tutors, heads of sixth form or anyone else who wants to help A level students achieve their potential, The A Level Mindset offers 40 easy-to-use activities to develop students' resilience, commitment, buoyancy, motivation and determination. It could be your key to transforming student outcomes.